I love to discover new traditional foods. 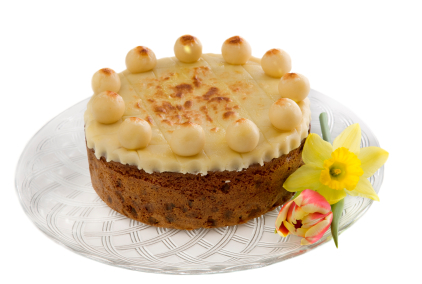 Simnel Cake is a new one to me. It’s a traditional British Easter cake, to celebrate the end of Lent and has been eaten since medieval times. Im obviously a bit slow catching up with this one! I found a lovely recipe to try. Sure, its a cake but a little bit of treat as a celebration now and then is fine. After all, food isnt just about health, its about family, tradition and celebration as well. This recipe serves 12. Happy Easter! Preheat oven to 150 degrees C. Grease and flour a 20cm springform pan. Line the bottom and sides of pan with greased baking paper. In a large bowl, cream together the margarine and brown sugar until light and fluffy. Beat in the eggs one at a time. Beat in the flour. Stir in the sultanas, currants, glace cherries, mixed fruit, lemon rind and mixed spice. Pour ½ of mixture into prepared cake tin. Divide your marzipan into 3 equal portions. Roll out 1/3 of it out to a 20cm circle. Place the circle of marzipan on the cake batter in the tin. Cover with remaining cake batter. Bake in the preheated oven for 2½ hours, or until evenly brown and firm to the touch. If the cake is browning too quickly, cover with foil after an hour of baking. Let cool in tin for 10 minutes, then turn out onto a wire rack and cool completely. When the cake has cooled, brush the top with warmed apricot jam. Roll out the next 1/3 of the marzipan into a 20cm circle and place on top of cake. Divide the remaining 1/3 of almond paste into 11 pieces and roll into balls. (The 11 traditionally represent the Apostles at the last supper). Brush the almond paste on top of cake with beaten egg. Arrange the 11 balls around the outside edge on the top of cake. Brush the balls lightly with egg. Place cake under the griller (on medium heat) for 8 to 10 minutes, or until almond paste is golden brown.